This original house is centrally located in Amity and built from local hardwoods. Steeped in Island history this unique property has been the setting for many family holiday memories. So take the opportunity to come and make your own special moments set in the most beautiful gardens and short distance to all sorts of fun activities, snorkelling, fishing, kayaking, swimming, bush walking. With a 5 min walk to the local shop, jetty and restaurants this location is prime. Koalas can quite often be seen in the bush adjacent to the property and guests enjoy sitting on the deck and watching the birds. There is a bird feeder in the garden and seed supplied. The house has a galley style well appointed kitchen with large double door fridge/freezer, microwave and coffee machine (ground coffee). A second large beer fridge is located in the downstairs foyer and there is reverse cycle air-conditioner in lounge which opens onto private rear covered deck overlooking the bush. 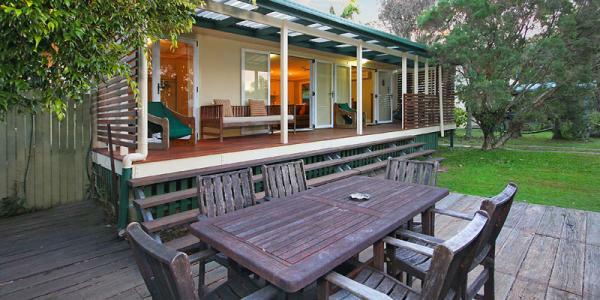 Deck has large gas BBQ and large outdoor setting perfect for alfresco dining and entertaining. 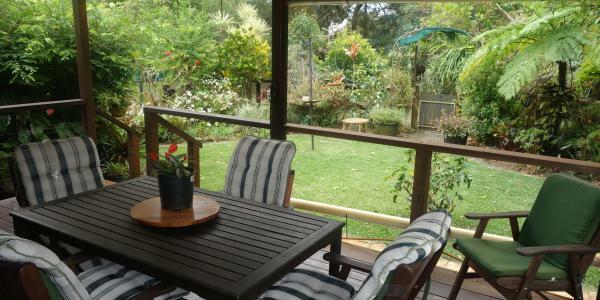 The property is fully insect screened and has 3 small bedrooms plus extra single in the downstairs area (which is also airconditioned) and comfortably sleeps 6 guests in two double beds and 2 king singles. Inside bathroom has recently been renovated and there is an outside shower and toilet. Loads of original features including vintage sea themed wallpaper and original round uprights. This property is partially wheelchair friendly with ramps and aid assists in bathroom. Foxtel is also installed. The property is fully fenced and gated and you are more than welcome to bring your furry family friend , although only really suitable for smaller dogs due to the height of the fence. Off-street parking for one vehicle. Garage is not available to guests.